Crossing the landscapes of four evocative islands on Scotland’s remote west coast, this excerpt reveals traces of a forgotten past. Stunning photography accompanies Hunter’s exploration of landscapes created by people, and the footprints they left behind. 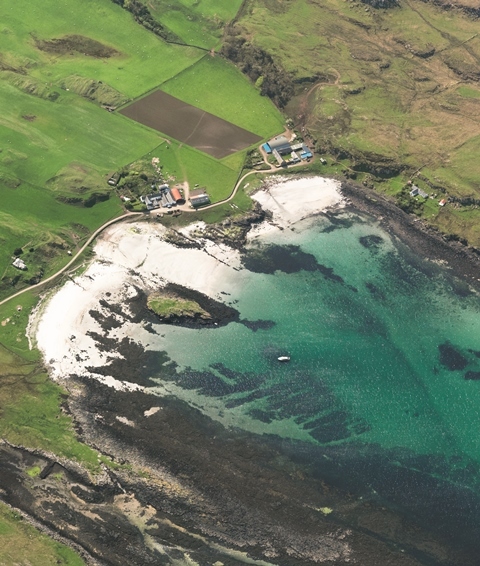 At the turn of the 19th century the parish of the Small Isles, comprising Canna, Eigg, Muck and Rum, were visited by Sarah Murray, one of the few female visitors at that time. She described them as ‘emerging from legend’ – a particularly apposite phrase which, in archaeological terms, encapsulates the end of those centuries of which we know little, and the beginning of those years of which we know more. It was the time when the cultures of island communities were brought into the realities of an economic world which provided massive social change. 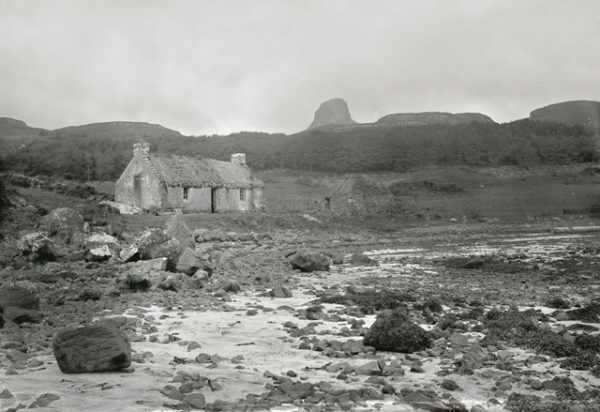 In researching The Small Isles it soon became clear that the traditions and customs developed over hundreds of years in these four islands had become either depleted or erased in the first part of the 19th century. This was the result of eviction and emigration, enforced or otherwise, which saw the wholesale exodus of family units and social groups. These movements occurred throughout the Highlands, but their effects were most pronounced among the islands where the physical constraints of insularity shaped culture on a local scale. Reduced populations lived under new controls, former communal enterprises were no longer possible with a depleted population, social structures changed, and the way of life was fundamentally altered. Incomers arrived and within a few generations local cultural memories had faded and a new order developed. Place-names had become obsolete or altered, buildings and structures abandoned, and traditions forgotten. In most respects the Small Isles had become islands without memories – islands ungrounded from their pasts. Their traditions and customs over the centuries now lie embedded in a landscape of grass-grown foundations, field systems and obscure earthworks. Landscapes were created by people, and The Small Isles is about the footprints they left behind. Rum is by far the largest of the four Small Isles, bleak and recognised by its towering mountains; the other three are smaller, greener and look friendlier. Canna and Muck are both relatively low-lying, but Eigg is characterised by the sombre silhouette of the Sgurr, a huge jutting stump of pitchstone eagerly climbed by day-trippers. The whole group lies to the south of Skye, adjacent to the sea routes that run up the west coast of the mainland or across to the Western Isles. The islands each have unique topographies and different stories to tell. The islands are all very different too in their expressions of past human activity as a result of the limitations of individual island landscapes. Between them the Small Isles contain a rare collection of monuments of all types and from all periods. There can be few places so geographically concentrated that provide such a vivid illustration of Scotland’s past from prehistory to the 20th century. 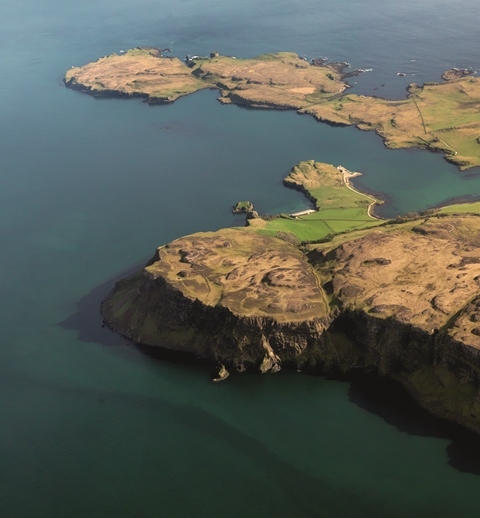 From earliest times the four islands offer lithic workings, burial mounds, prehistoric hut-circles and field systems, coastal forts indicative of an elite presence, and Early Christian monuments. From later times survive the jumble of successive building foundations of townships, farmsteads and outbuildings, and a landscape peppered with shielings for use in the summer months. 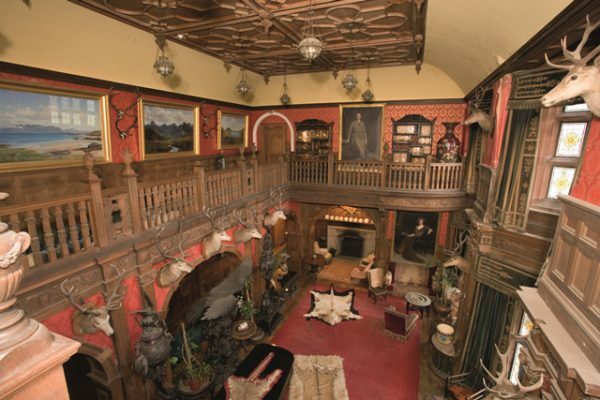 Then, finally, there is the inescapable and dominant presence of the modern landed gentry, their sporting estates and the sometimes lavish homes and farms they built. Some of these still stand and are occupied, such as Eigg Lodge, Kinloch Castle on Rum, and the modified farm at Gallanach on Muck. But we can only identify the activities and dwellings of the majority of islanders, the ‘everyday folk’, through what is left, typically lengths of walling, foundations, grass-covered ruins, natural features altered to suit some particular purpose, earthworks and cultivation lines. The monuments possess an anonymity, a type of clinical detachedness, which is hard to ground in the heavily peopled landscape in which they once played a part. Some of these monuments can be brought to life by the descriptions written by travellers in the 18th and 19th centuries. They spoke to people who lived and worked in buildings that are still recognisable on the ground, but are now ruinous. They allow us to picture a living landscape rather than a dead one. The township ruins seen on all four islands speak only of desertion, but the full social impact of the Clearances that brought about their abandonment is difficult to appreciate without the eyewitness laments, or the listing of names and ages compiled as the émigrés arrived in Nova Scotia. Even a little knowledge about the people who lived there makes the ruins of the old townships less impersonal. In the many centuries before the written accounts we can only guess or imagine how the landscape may have looked, and how it was populated. Where did people live? How were they organised? How did they use the land? Unfortunately, the raw material needed for answering these questions usually consists of partially hidden, distorted fragments of what was originally there. Many of the sites discussed here can only be interpreted in the vaguest of terms, or in levels of uncertainty which might perhaps be improved by archaeological intervention. There is never likely to be a strategy for investigating, preserving and presenting the archaeology and landscapes of the Small Isles that will be to everyone’s satisfaction. There are too many differing views and interests as to what might be important, not to mention other management issues such as farming or conservation where the agendas may be in conflict. But the character of all four islands is undeniably moulded by their past and is to be witnessed in its many surviving forms. Most of the sites and monuments lie beyond the roads and trackways; some are hard to find, surviving as nature has left them. Discovering the sites often requires lengthy walks across beautiful and isolated landscapes where it is hard to imagine the density and complexity of the communities that existed there, and which have inspired so many curious visitors and travellers over the centuries. It is a past to be shared and enjoyed, even if not always fully understood. 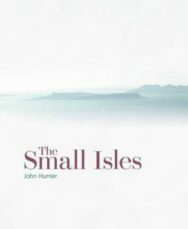 The Small Isles by John Hunter is out now (HB, £25) published by Historic Environment Scotland.